She shoots, she scores!! Team Krafty1 5- World Cup 4! I finished in regulation time and did not need the two overtimes that are currently underway. If I were a betting woman, I would put my money on Italy; they're wearing blue and so am I. Just as a reminder, here is the original pattern photo. The model is not nearly as endowed with "Dutch" attributes as I am (Remember what Rod Stewart sang about the "lady with the Dutch accent"!). I'm anxious to see what others managed to accomplish during the matches. Thank you Yarn Monkey for hosting this event! I now have a new sweater (in large part) because of you! Check it out! All four sweater pieces are completed. She shoots, she scores: goal 3! Quickly, the play resumed and another quick goal (blocking) was set up. Once the blocked pieces are dried (hopefully by tomorrow evening) the final goal (assembly) can be made. The sweater should be finished before the final whistle blows in Germany. There was an injured player on the field. The past week has been filled with dozens of knitting hours and my shoulders, arms, and hands ached. 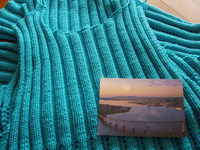 Upon finishing the sweater front, I picked up the phone and called the salon for a massage appointment. I just returned and feel rejuvenated. Notice the postcard in the photo. It's from my KSKS pal. She was on vacation in San Diego and mailed it. Thank you pal. It was so thoughtful of you to think of me during your travels! Now that my World Cup Knitting sweater will be completed, I can get to work on my own KSKS pal's kit & bag. The newest Knitty is up and I'll have to see what sock "inspirations" I can find. (Though not for socks, my brother has already sent me a link.) Time to put my thinking cap on and enjoy the after effects of my massage. Goal 2 (sweater back): Score! Yes, Monday night I DID manage to finish the sweater front. It was such a sweet goal. One of those quick drives down the field to score without any interference from the "opposing team." Unfortunately, Goal 3 (sweater front) has run into major interference in the past 48 hours. First, the sweater ran into interference from, of all places, an extra day off. Normally, an added day off means added knitting. However, that does NOT hold true when the day off is a holiday. Especially, one that involves lots of family friendly activities and PERFECT weather! I mean PERFECT weather! Yes, it was the 4th of July, but in the States that's also Independence Day: complete with parades, picnics, and fireworks. Evenings are usually prime knitting time for me. But on the hillside outside my office (where with the turn of a key we have immediate, "private" bathroom access! ), with a small gathering of humanity, not as much knitting was completed. (See us there, we're right in the middle. Well, maybe a little right of the middle.) Plus, what is normally a 10 minute drive home turned into nearly 45 minutes. Then, another 45 minutes to calm the dog down who had (as usual) mildly freaked out due to booms from the fireworks from two communites and the neighborhood. Unfortunately, there will be continued interference. The kids took off this morning in their grandparents' "retirement home" (grandparents included). In celebration, I got my hair done (good-bye gray hairs) and the husband and I are going to have a mid-week "date night". It's hard to say what you should cheer for: Team Krafty1 or Team Date Night. In either case, SCORE! Author's note: in these instances the term "interference" should not be interpreted as a negative! The Knitting World Cup is in the final 6 days. If this were a soccer match the score would be 4-1 in the World Cup's favor. There are 5 goals that I must make in order to "win". Hopefully, Goal #2 will be completed tonight. On Wed. I lamented that we couldn't leave town because of Java. Thanks to two readers we had 1) a suggestion to find a kennel at our destination (which we found, thanks Trek) and 2) an offer to dogsit (thanks Kelly). We told the kids we were going to Rhythm & Booms - the largest fireworks display in the Midwest set to music held annually in Madison, WI. We used to live in Madison and would go to R&B each year. Nowadays, going means we get to see our friends and neighbors who still sit in the "secret place" that we introduced them to when we lived there. However, we watched the weather Thursday night and had to make a difficult decision. According to the long range forecasts, it looked as if there would be a pretty good chance that the event would get rained out. I say difficult because how often are the weather people right!?! The temps for Saturday were also predicted to be in the 90's, that along with a possible front would mean afternoon and evening thunderstorms. We told the kids (who were disappointed) and told Kelly "thanks, but no thanks" (she was equally disappointed) and made new plans for activities at home for Saturday. There are times in life where I hope that I've made the "right" decision. Last night, mother nature let me know that I had. That's right, the storms rolled in right around sunset as the front rolled through. Madison also ended up with a different kind of "rhythm and booms" than originally planned and rescheduled the event. Java and KC seem comfortable with the decision we made. Plus, I managed to finally get started on my sweater back. There are only 7 days left for the Knitting World Cup. Thankfully I have a couple extra days off. There are some great prizes being offered, though just having this sweater finished and ready for me to wear to work would be prize enough! Now you know how I'll be spending my Sunday....more later. Not like I haven't knit anything this week. There were the Independance Day socks, two (One Skein)felted bowls, and a Mason-Dixon washcloth (that's it providing comfort to the sleeve above). Such lovely summer colors. The color name for the sleeves (and the rest of the sweater) is "Popsicle Blue". Totally appropriate. Time to quit procrastinating goofing around and cast on the body! The US may have been eliminated by Ghana today in World Cup Soccer, but I'm still working towards my goal. The second sleeve is nearly finished. 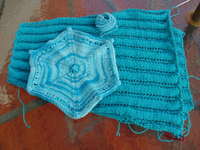 Once finished, I will block both sleeves and recheck my gauge before starting the body of my Knitting World Cup project. The pattern is fairly simple, but I can only do so many YO, K3tog, YO repeats before my wrist starts screaming its discontent with the odd dips and figure-eight maneuvers. Since my sock needles are free, I'll need to cast on a new pair. I still have not found Trekking XXL yarn that I'd like to knit for Trek with Me. Soon I'll have to start posting about all the places that I'm "trekking" in search of the right yarn. Don't worry though. My needles won't be naked long. 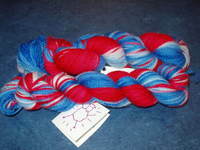 Today I got this fun, patriotic yarn from Lavender Sheep. KC was so excited when she saw these skeins at Lavender's Etsy shop. The price was right and there is plenty here to make socks for my youngest to go with her 4th of July outfit. Plus, Lavender was the one who made my Sockapal000za socks with yarn that she had produced and I'm STILL in love with those socks! I should have no problem casting on these tonight. 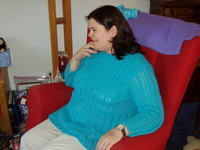 Oh, one last thing, "Hello" to all of you who are stopping by thanks to the Knitting Bloggers Ring. My registration was accepted and added yesterday and there has been a lot of new traffic. Welcome! Stop by anytime! Thanks to those of you who have given their input with my sock dilemma. There is still time to voice your opinion. Currently it appears that I'll make a trip to the "frog pond" tomorrow. In the meantime, I am getting to work on my sweater. I like the ease of the pattern. The first sleeve is finished. I like the pattern. The right side is made up of knit 4, purl 3. On the wrong side, the 3 purls are turned into yarnover, knit 3 together, and another yarnover. This will be a great summer sweater. Plus, once finished, I can release a bit of my willpower. Over the weekend I managed to finally listen to Cast-On. I was pleased to find out that, even though I don't have an MP3 player, I could listen to these pod-casts on my computer. I have to thank Lavender Sheep (again) for turning me onto this. She also has listed information for a Knit Sock Swap Kit. Even though I am already involved in three exchanges, signing up for this exchange would ensure that I get my sock pattern written this summer (participants don't HAVE to write a pattern). Only 24 hours left to sign up. I think that I'll take care of that right now. 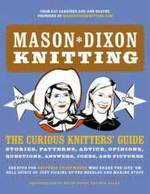 I recently picked up the Mason-Dixon book from the library. (Sometimes, I like to preview books before I actually purchase them. Part of the whole willpower theme.) I've seen their blog and was curious to see what kind of book they came up with. 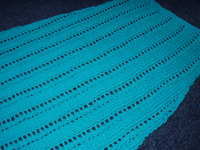 I've also seen the Knitalong blog and noticed a dishrag. That's right, a dish rag. And there are a lot of blogs out there with postings that people have discovered and are in love with this dishrag. Imagine my surprise when I went through my crocheted dishrag patterns (I was searching for a pattern for my grandmother) and found a knit one in between. Not any dishrag, but this exact dishrag pattern! This free flier was dated 1992 and written by Michelle Kazalonis. I didn't knit back then, but I took the free pattern along. (If you're wondering whether or not I can "pack-rat", you have your answer now.) It's amazing to me whenever I come across things that are re-discovered or made to fit the times. In fact, one person has adapted the pattern to create a cover for her Swiffer Scrubber. I kid you not! Check it out! Another new "old" thing is my sock bag from Trek. 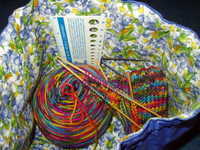 She makes wonderful bags for your knit projects (socks) or drop spindles as well as double point needle cases. I sent her some of my quilting fabric and she sent me my very own sock bag. It is so cool to see my old fabric being put to a new use. She has a large number ready and would be happy to swap something with you for one. If you have a secret pal that you'd like to treat, Trek will mail it to your pal to help with the secrecy. Go check them out. So in honor of everything old is new again, I've decided to dive into the pending sweaters and knit one for the Knitting World Cup. It's time to resurrect this one and knit it up so that I can wear it yet this summer at work. 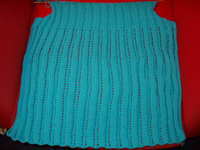 The pattern is from Family Circle's Easy Plus-Size Knitting. I have wanted to knit this for a couple of year. I found the yarn for it in Chicago last summer and it's been in my basket ever since. So this afternoon I swatched. (Yes, I swatch.) This is going to be cotton. Cotton grows. I don't need a plus-sized sweater to grow! (In fact, I'd prefer if I could shrink the wearer a bit.) Tomorrow I will re-measure my swatch and see how things turned out. Then cast on the sleeves tomorrow evening. Maybe when it's finished, little old me will feel like new again. As I mentioned last night, it'll be a busy day here at the Krafty house. I leave you with this bit of humor for Friday. First, the World Cup of Soccer is right around the corner. In honor of it there is the World Cup of Knitting. 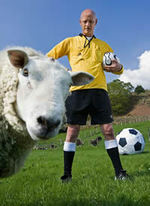 Now, the Barmy Sheep of Cumbria have jumped on the "sheep wagon" to record a song and video in support of their team! That's right, the sheep have recorded a song and video. You can find it here. P.S. Happy Birthday Fairy Godmother!